Rivest-Shamir-Adelman (RSA) is a public-key cryptographic technology that uses the mathematics of so called “finite field exponentiation”. 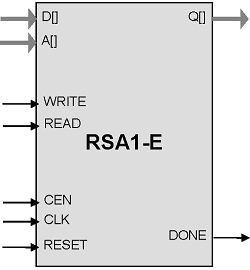 The operations necessary for the RSA cannot be efficiently implemented on an embedded CPU, however, typically requiring many seconds of the CPU time for signature verification. RSA1-E implements by far the most time-consuming operation of the RSA cryptography: so called “exponentiation” to enable low-power operation of the battery-powered devices. The design is fully synchronous and available in multiple configurations varying in bus widths, set of finite fields supported and throughput. The core implements the exponentiation operation of the RSA cryptography Q = Pk. The operands for the exponentiation: k and P as well as the modulus are programmed through the microprocessor interface and the calculation is started. Once the operation is complete, the result Q can be read through the interface.